Satti Upanyas by Buddhadeb Guha ebook pdf get from this page below. Buddhadeb Guha is a most famous bengali writer. He wrote lot of fictions, novels (Upanyas), Stories. Short stories and essays. He was born on June 29, 1936 in Kolkata, India. He is popular for his novels and short stories. His novels and short stories are very attractive among the new generation. His most famous novel ‘Madhukori’ according to many, it is considered a milestone in bengali literature. We can see in his writings, the background of many novels is forest and nature. He wrote a lot of novels about forests and nature, because he loved forest and nature. He received many awards including Ananda Puraskar in 1976, Shiromani Award and Sharat Puraskar. 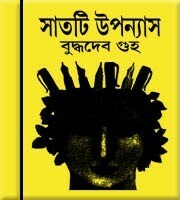 The famous publisher from Kolkata published the seven favorite novels in one book of his writings. The seven novels are Sajhbelate, Pakhira Jane, Sukher Kachhe, Bindas, Sareng Miya, Samudra Mekhla and Parnamochi etc. Readers can get this golden book including above favorite seven novels as pdf from this page below. Satti (seven) Upanyas all book as pdf file link below. All in One Book of Satti (seven) Upanyas now Download.